Unlike other studies, the Oxford research analysed data from Ireland, the US, and the UK to support its conclusions. The researchers used a rigorous methodology to gather how much time an adolescent spends on screens per day, including both self-reported measures and time-use diaries. This is important as many studies are based solely on self-reported digital technology use, even though recent work found only one third of participants give accurate accounts of how much time they spend online when asked after the fact. Additionally, the final of the three studies conducted was preregistered, meaning that the researchers publicly documented the analyses they would run before they analyzed the data. This prevents hypothesising after the results are known, a challenge for controversial research topics. 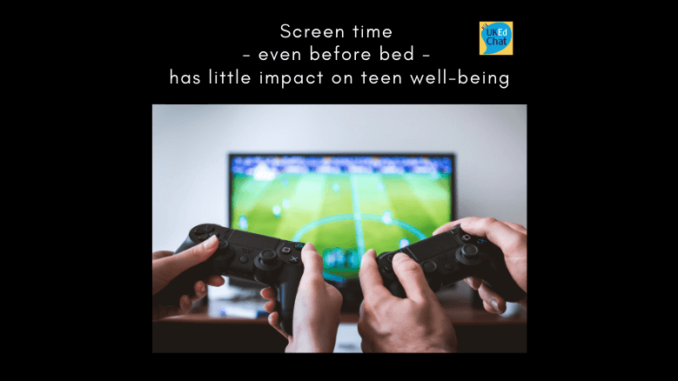 “Because technologies are embedded in our social and professional lives, research concerning digital-screen use and its effects on adolescent well-being is under increasing scrutiny,” said Orben. “To retain influence and trust, robust and transparent research practices will need to become the norm–not the exception. We hope our approach will set a new baseline for new research on the psychological study of technology,” added Przybylski. The APS journal Psychological Science is the highest ranked empirical journal in psychology. For a copy of the article “Screens, Teens, and Psychological Well-Being: Evidence From Three Time-Use-Diary Studies” and access to other Psychological Science research findings, please contact Anna Mikulak at 202-293-9300 or amikulak@psychologicalscience.org.